Where we've been hanging our hats! Parents to the rescue! We have been "rooming" with my parents since May, and we are incredible grateful that they have welcomed us with open arms, and basically fed us dinner for the past 7 months straight. No complaints here that's for sure! It has added a large commute to our regular routine though, and not having our own space (especially while being pregnant) isn't always ideal. My parents seriously rule though, and not having to pay rent throughout this process has been a lifesaver...not to mention helped with our furniture shopping budget! Not having my home office has honestly been the biggest challenge of all. I had no idea how much I loved working from home, until I no longer could. I've been jumping from coffee shop to coffee shop for the better part of the last 6 months, which is not only annoying, but can also get a bit expensive lol! It's also been a big adjustment for me, having to plan my days in a totally different way than I am used to. So, when I leave the house in the morning, I am leaving the house for the full day. No more just jumping into town for a meeting or an errand here and there. It definitely isn't the worse thing in the world, and my reward at the end of this is going to be a brand spankin' new space at home to work from, so I really can't complain all that much. But, combined with being pregnant throughout the entire build, this has for sure been the hardest part for me. Taio is our "chog" (you know - Child/Dog), and has been totally spoiled his entire life, in that he is either at home with me or at the store with Nick. So, the fact that we haven't really had a home to leave him in (without feeling totally guilty that my parents have to look after him), has had its challenges. I've gotta give it to the dog though, as he's been pretty great about his whole world being turned upside down this year. As I mentioned above though, this whole process has been absolutely incredible, and so a few challenges along the way are nothing to worry about. We have our fantastic builders, Philco Construction, to thank for that! I can't imagine having to be our own contractors throughout this journey, or not having complete trust with our builders. We can't wait for move in day, and to show you all the finished product! And then the fun part begins...the decorating! Well folks, the house is officially gone and we have BEGUN!! (And if you have no idea what I'm talking about, head on over to this post here to read about the start of our home build). As I mentioned a couple of weeks back, the journey to get here has been a long and emotional one, but now that we are here, I am giddy with excitement! We have a wickedly talented team building us our dream home (thank you Philco Construction! ), and I have no doubt that it will be even better than I could have ever imagined (because any house that has more than 1 bathroom will be a win in my books). Our beautiful plans were designed by Ryan Hoyt Designs, and the house design is a Modern Farmhouse. Every time I look at the plans, my heart literally skips a beat, and I am utterly obsessed with all things design these days. 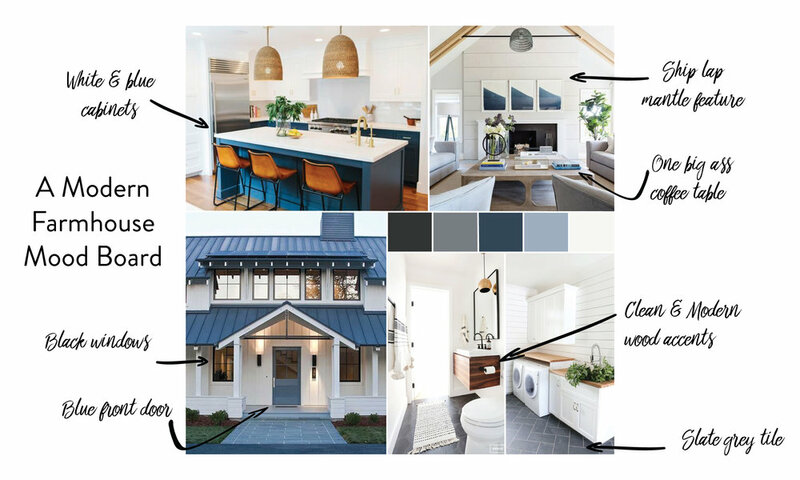 The interior style is going to be Farmhouse meets Coastal meets California, and both Nick & I have gotten totally lost scouring instagram accounts from some incredible designers (namely: Studio McGee, Emily Henderson & Becki Owens). Our hope is to have a bright and welcoming home, one in which you would feel comfortable kicking off your shoes, pouring yourself a drink, and staying awhile. While I want the overall palette to be light and neutral, I am so excited to infuse pops of happy colour into the space, a nod to our love of all things Hawaii. Now it is going to be quite some time before the rooms start to take shape, and I can get my hands dirty designing, but there have already been a lot of decisions made (flooring, appliances, kitchen cabinets, plumbing fixtures...) which I am thrilled about! I thought I would take some time today though, to share with you our overall house Mood Board, as well as some rooms that have been providing me with major inspiration as of late. Thank you so much for following along (it seriously means the world to me), and stay tuned for another update soon. If you've been following along on the blog lately, you may have noticed a few subtle hints that have been dropped. Well, I am SO excited to be sharing with you all today, the very exciting (and slightly terrifying) news, that Nick & I are building a brand spankin' new home! And not only are we building a new home, but we are having our current home removed to make room for the new one (and moving in with my parents in the meantime). We started working on this massive project back in September, and to say that we are anxious for there to be a hole in the ground would be a HUGE understatement! It has been a roller coaster of emotions over the past few months, as designs were perfected, building plans started, and the budgeting progressed, but we are nearing the finish line of the planning stages (yay!) and getting ready to move out. Now, as much as all this is incredibly exciting (and I am thanking my lucky stars every day that we are getting to do this), it is also quite bitter sweet. Saying goodbye to our current home and watching it be taken away is going to be really hard. It is the only house that Nick & I have known together, and our entire relationship has unfolded there over the past 11 years. We have many wonderful memories in it, and I am going to miss so many little things about it. It's the house we first brought our pup home to, and the house that Nick proposed to me in. The house that hosted many (many!) parties, and the house where FKE was born. This next week is going to be an emotional one for both of us, and I will be doing my best to keep it together. This beautiful built-in was built by one of our very talented carpenter friends, and it is hands down, my favourite part of our house. He matched it to the connecting mantle perfectly, and it suits the house so well, everyone always thinks it is an original feature. In our kitchen, I have a wall dedicated to our latest and greatest pics (always printed from Artifact Uprising)! It's located right next to our coffee machine, and so I always get a big smile every morning looking at them, while waiting for my first cup of the day to brew. It's no secret that Nick & I like our cocktails. This little corner houses just a small selection of our favourite spirits, but it is always fun to look through it when entertaining. And the table it's on? Nick's grandfather made that, and after I gave it some TLC with a fresh coat of paint years ago, it looked good as new!